Success doesn’t come quickly when you decide to take on the role of a full-time freelancer. Even if you’re one of the most talented professionals in your field of skill, relaying that talent to others, particularly those with needs that match your abilities, can be a painstaking, time-consuming process. All sorts of people are shifting their traditional 9-to-5 workloads into becoming freelancers so that they can dictate their hours, their schedule, and for whom they work. Freelancing can sound like a dream come true for those weary of the long commute, the uncomfortable business attire, and the endless stream of bureaucracy and office politics. 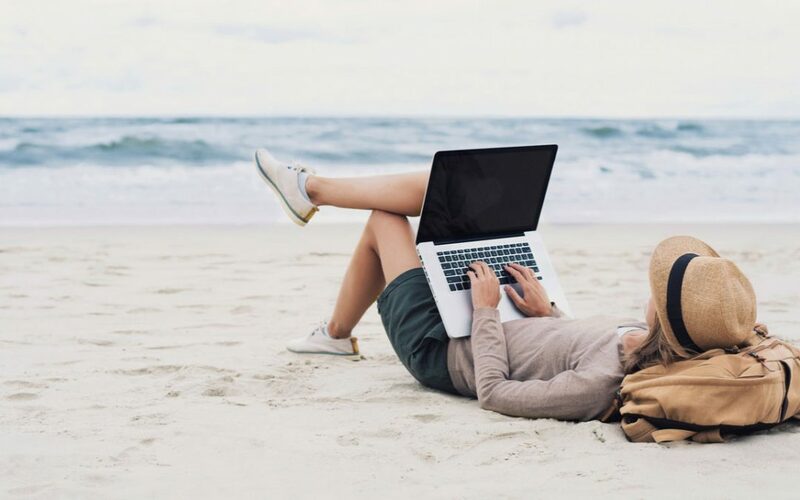 But the image of a freelancer wearing shorts and a T-shirt, lazing the day away in a hammock with a laptop in one hand and a pina colada in the other is just as much a dream. Freelancing is flexible and can be very fun, but it also takes an acute mind and a whole lot of effort. Jobs are not just handed to you when you freelance. You aren’t assured of a steady paycheck every two weeks by merely showing up and sitting in front of a terminal like you are in many a corporate environment. If you are considering becoming a freelancer, particularly on a full-time basis, here are five best practices to follow to make your road to success as short as possible. You might like to work in your pajamas between midnight and 6 a.m., but your clients need to see you as a professional, highly skilled person that they have no problem entrusting their important work to. The professional online persona is the face you show past, current, and potential future clients. The more professional you look, the more people are likely to hire you, recommend you to colleagues, and rehire you down the line. If you’re joining an online freelance marketplace, make sure your profile is 100% complete and that you take a lot of time to fill out each section and answer each question as honestly and thoroughly as possible. Create a portfolio of your work as it relates to your freelancing industry. Depending on what form that work takes, there are lots of websites – both free and paid for – to pick from that will let you create a visually appealing collection of your work. Make sure to update it frequently. Clients hiring you in 2018 aren’t going to be that excited about seeing your best work from 2011. Build or buy a professional website: WordPress is a great choice here because it’s easy to use, looks fantastic, and lets clients really see your story and what you’re all about. Blogging is a fantastic way to connect with clients and let them get a sense of who you are when they are first considering hiring you. Blog about your own experiences, about your industry, even about freelancing itself. The more insight into you that you can offer, the more likely clients are to make a connection with you. Most freelancers are fantastic individual workers, capable of balancing multiple deadlines and projects like a circus performer. But lots of clients aren’t built the same way. They want updates and assurances on how work is being done and when it will be finished. Because so much freelancing is done remotely these days, with clients and freelancers sometimes not even located on the same continent, communication is extremely important as it relates to your success. Their preferred lines of communication: Do they want phone calls, emails, texts, instant messages? How often they want updates: Each time you finish a smaller task? Once a week? Or none at all until the project ends? How they can get a hold of you: Give them every form of communication you check regularly: phone, email, Skype, Slack, whatever it is. Most importantly, you must communicate with them if anything changes on your end of the job, including you getting sick, needing more time, or being unsure about the job requirements. If the deadline is 12 p.m. on Friday and you know in advance that you won’t be able to complete it until 3 p.m., it’s imperative that you let them know as quickly as possible. Not doing so is entirely unprofessional and is the quickest way to getting yourself never hired again and never recommended. Keep your client in the loop at all times. Never let the job end with a surprise. It’s straight out of a motivational poster, but it’s also spot on. No matter what field of freelancing your expertise falls under, people are hiring you because you’re good at what you do. There will be times when you struggle to start projects for fear that you won’t do them well or the client won’t like them. At other points, you’ll get stuck on how something should fit into the project. It’s times like these you have to crack your knuckles, take a deep breath, and take the plunge. You’re the creative talent here, show what you can do! No matter if you’ve been freelancing for 30 minutes or 30 years, you always need to forward-thinking in lining up the next job and the next one and the next one. Having the freedom to work for several different clients is fantastic, but one of the toughest parts of freelancing is that jobs can end very suddenly. This isn’t a comfy 9-to-5 gig where you just do the work put in front of you and enjoy your 2 weeks of vacation, 401(k) plan, and corporate-grade health insurance. You’re earning your livelihood in a fast-paced, exciting environment, and you need to be proactive as much as possible to keep it going. Even when things are going so well that you’re having to turn work down, make sure you communicate with those clients that you’d love to work with them but your schedule just isn’t permitting it at the present time. If you can, give them a date when you’ll be free to take on more work and keep them in your contacts. If they were willing to hire you once, it’s likely they’ll do so again. If you’re hired for a long-term project, you don’t have to worry so much about the next job. But when that project starts wrapping up, that’s the time to start putting out feelers and actively searching for what’s next. You want as little downtime between the end of one job and the beginning of the next. It’s a very uncomfortable feeling to be a freelancer without a current project. Finally, be honest. Be transparent. Be helpful. Treat people the way you would want to be treated in a business transaction. If you’re doing most of your work on a computer, remember that emails or instant messages sent in anger are forever, and it takes a whole lot of work to undo their intent. And you can’t put a price on that kind of advertising. If you’re kind and generous and thoughtful, clients will remember you, come back when they have more work, and pass your name along to their network of sources.